It all began with a short test to see whether shirts would sell well on Woot. Well, that short test paid off when 'Shirt Woot' sold their first t-shirt on July 2007. Since that time, Woot has been offering custom made shirts every weekday. In September 2007 Woot began offering shirts on Weekends as well. The shirts offered are silk screened in Woot's Carrollton, Texas facility and the designs are chosen by Woot editors in their Seattle, Washington offices. While most of the designs are from established artists, you will occasionally find designs which have been selected in a Woot community competition that is referred to as the "Derby". Shirt.woot.com currently ranks #12 amongst sites offering online deals -- DX Offers ranks #11. In the Apparel and Shoes category, Shirt.Woot ranks at #1. 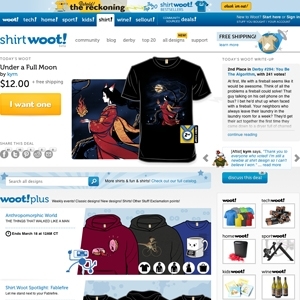 Shirt.Woot is considered the most popular deal a day site, ranking in at #1. As for the 2nd most popular site, it's Giveaway of the Day.